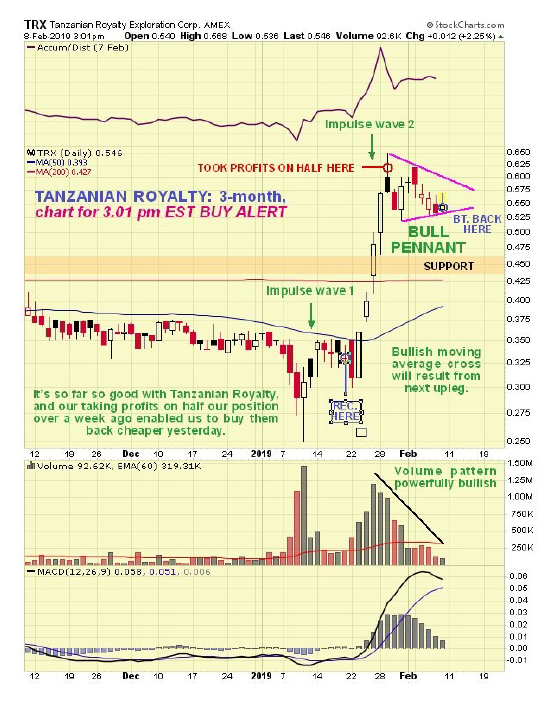 Weekly chart of the SPY. Hesitation last week when it hit the 50-week moving average. The 50-week average has been pretty reliable in the past seperating between bull and bear moves. Does this mean folks are paying off their cards and not paying interest?? Good green for the ASX goldies today. 3 to 4% range. Interesting. Metals getting hammered on a continued stronger dollar currently. Will be interesting to see what the GDX/HUI do. Platinum continues to get absolutely monkey hammered. Gold to platinum ratio at or nearing generational high. In fact, if current trends continue two oz of platinum will soon be trading for one oz of palladium! Just got this in an email. Anyone here subscribe to Clive Maund?? So there you have it - the solution to this problem has been set out. 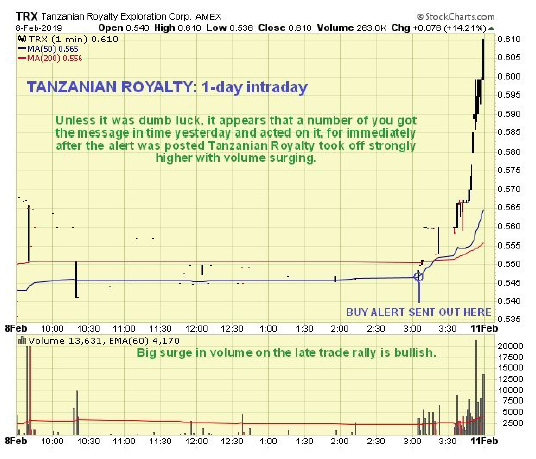 Finally it is important to note that although yesterday's action was certainly bullish, it does not necessarily mean that Tanzanian Royalty is starting its next run now - the Flag may not yet be complete and it may zigzag around within it for a while longer yet before the next upleg starts, in which case we might need to adjust its upper boundary slightly. That said there is a fair chance that yesterday's move does indeed mark the start of the next upleg. Flat but green today. We seem solid enough for the moment. 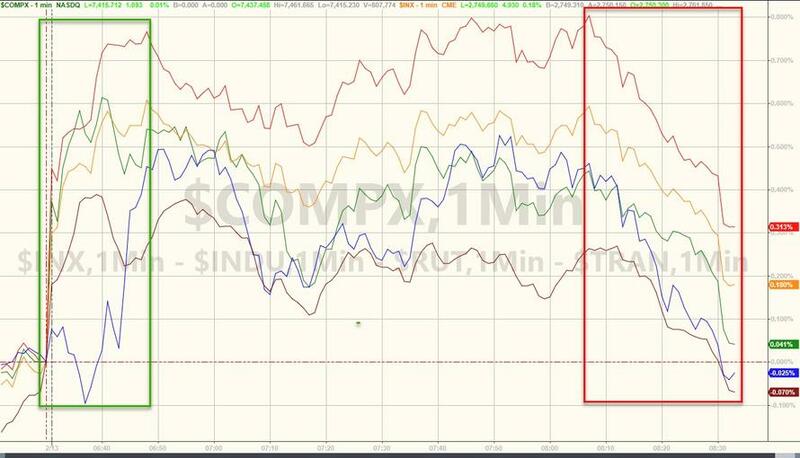 When the markets are strong, then the Feds prop the dollar. I think they found a formula to destroy gold holdings. They have so much power to manipulate anything that they want to do. Sorry I duped your post, brain fart... scattered focus at the moment. Life is hectic on a few fronts. PS> Solid green down here today with the ASX goldies... + ~6.5% on average. Wifey was a little shocked today when I turned in my numbers. I was telling her the thing with this is we have not even got going properly, gold stocks are still pretty much the red headed step child of the market. When this runs hard it should be stellar. Man, I have been waiting a long time to show those close to me that on a financial level I don't have my head up my arse. I wouldn't mind a little piece of that kind of action up here. Premarket metals action looking mighty tepid at the moment. Always same #'s to watch, forever and always....no matter what lines, fibs, indicators say. July 2016....who'd a thunk it? Action in the miners today looked a bit bearish. There's a chance we are setting up to take a tumble. Also, silver fell through short term support. I mean, unless you think gold's gonna go bitcoin with no trigger......there's a certain amount of back testing that needs to be done. Purpose of the pivot. Top of lower box 1296. No mans land 1305 to 1359. High risk area, can reverse any time. Not like the boxes where I've shown how those are predictable. I know the feeling. 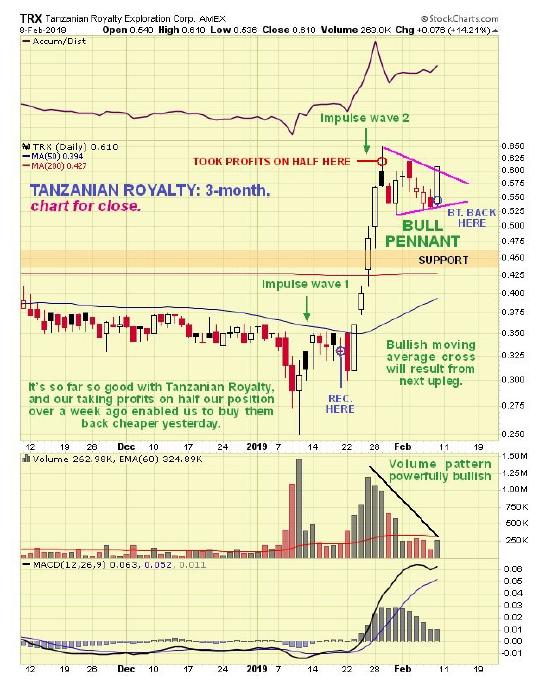 It's easy to understand how the herd dynamic works against you once you have invested in gold. The really hard bit will be selling when it's all going swimmingly well, there will be 1000 reason to own it then and it will still be a bad idea. I'm resigned to being the social black sheep re investment. If buybacks are removed - who will BTFD? L man. whatcha think about plat - we at or near a bottom? Right. why wouldn't they tumble when someone with power speaks the truth and shines a light on the pile of rubble they are elevated on. ...he screams, over the din of 'Happy Days Are Here Again' blasting over the loudspeakers. If you arent aware of these things - how can you ensure the safety of this forum against us being attacked by muslim terrorists disguised as trannys? 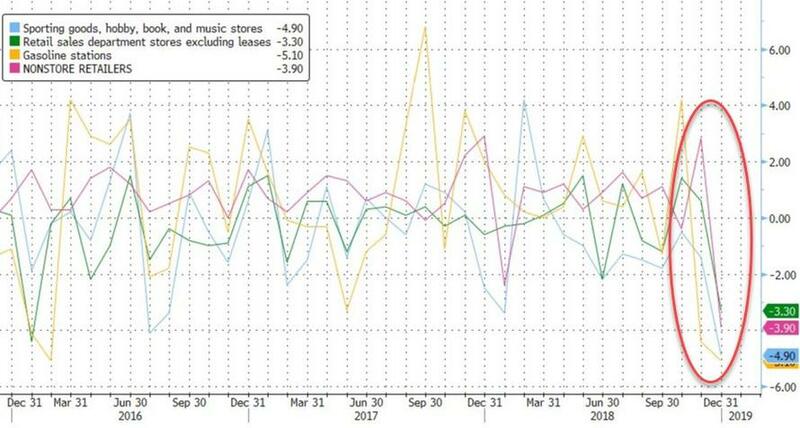 While Bank of America had warned investors to brace for a dismal retail spending print in January, expectations remained positive (albeit just a 0.1% MoM move) for December's (delayed due to shutdown) official spending data today. 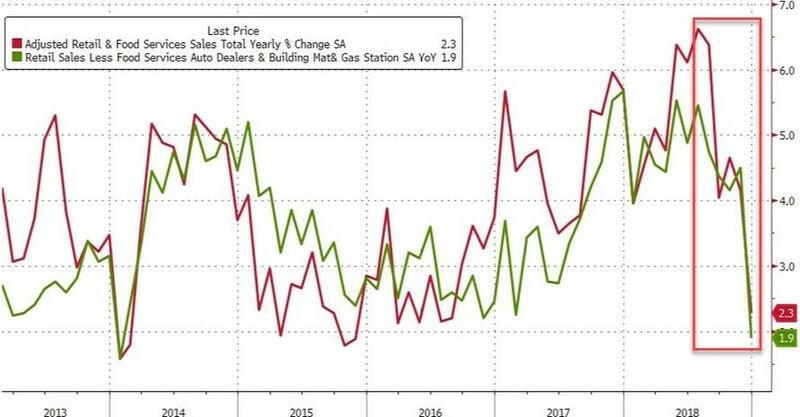 As a reminder, on Tuesday we reported that retail sales ex-autos, as measured by the aggregated BAC credit and debit card data, tumbled 0.3% month-over-month seasonally adjusted in January - the biggest drop in three years. 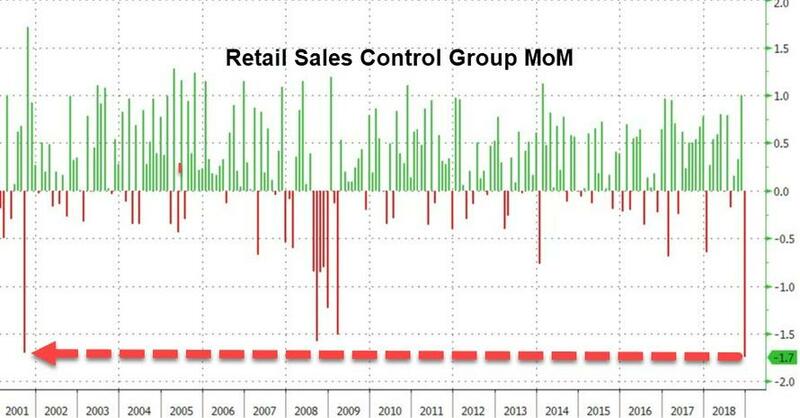 This followed a flat reading in retail sales ex-autos in December. 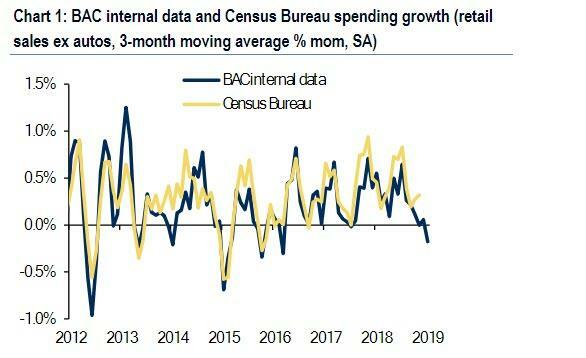 Turning to the January BAC internal data, in January, spending for 4 out of 14 sectors increased in the month, showing broad-based weakening. (oddly with Amazon claiming record holiday sales for the same month). Needless to say, this will be a disaster for Q4 GDP forecasts which we now expect to print in the low 1% range. 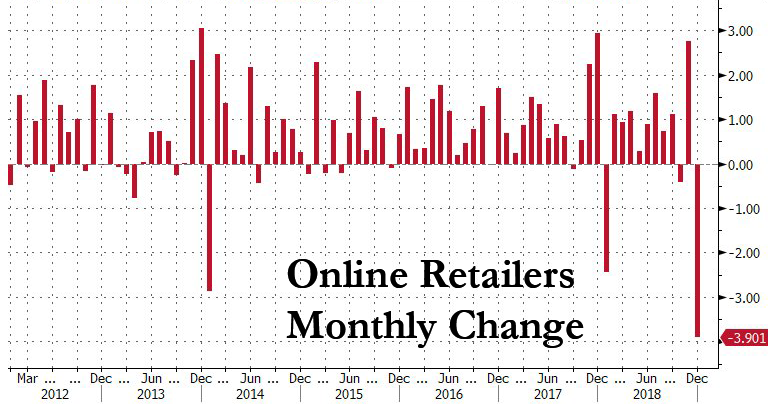 And finally, we guarantee the words "pent up demand" will be uttered today on CNBC as the latest excuse for why the US consumer is crushed. 10:00 - 16:16 is Chart Talk. 0:00 - 10:00 is reality check or recognition of disconnected. 16:16 on is promo talk. Gold down $200.00 ?! ! ! "It's gonna look a lot like Christmas !"